We offer the MPI (Modifying Phonation Intervals) Stuttering Treatment Program for the treatment of chronic stuttering in adults and adolescents. Welcome to the MPI Stuttering Treatment! The MPI program is now offered for adults and adolescents with chronic developmental stuttering at the UCSB Stuttering Treatment Clinic, at Power Stuttering Therapy Center, and at All Island Speech and Stuttering Therapy Center. The following videos show patients before and after the MPI stuttering therapy. 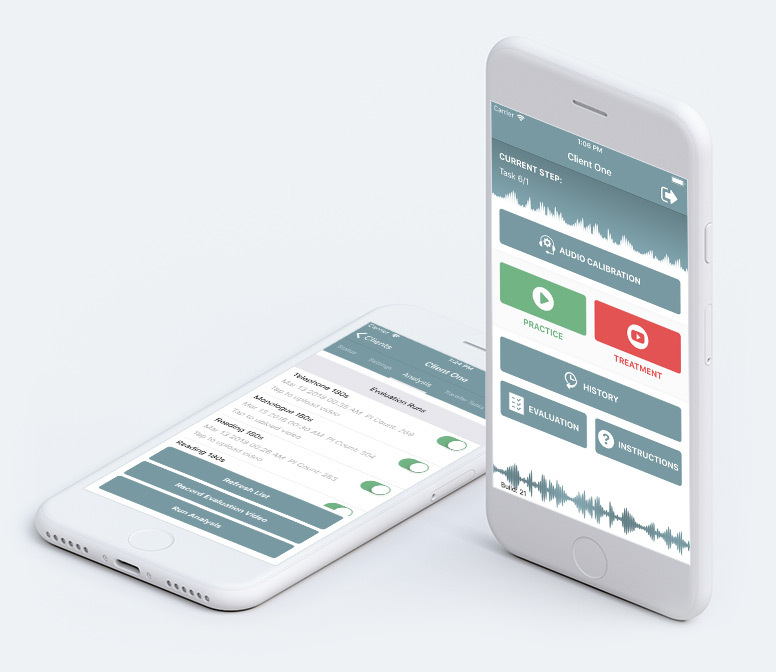 Designed and developed to complement the MPI Stuttering Treatment Program, the MPI-2 mobile application gives you unprecedented mobility and comprehensive coverage. it uses state of the art sound recognition technology and the full power of modern communication channels to help you achieve natural-sounding, stutter-free speech. Take advantage of our cutting-edge technology to help your patients! Find a certified clinician near you. Our son has stuttered since he was age 3. We sent him to hundreds of hours of therapy and used several different electronic stuttering devices with little to no help at all. He was picked on, ridiculed, and bullied at school. We were about to give up until we sent him to Mr. Power a little over 3 months ago. Our son, who is now 17, told us that ‘all other stuttering therapies I’ve been to have been a joke until now” He also said “this guy just gets it”. Our son spoke in fluent, complete sentences following the week of intense therapy, and 3 months later, is continuously making great strides towards complete fluency. Mr. Power’s follow up calls keep him on track throughout his journey. You have to realize that this in NOT a quick fix program, or that “Magic Pill”, it takes real work on the part of the patient, but trust me, a father of a stutterer, and a stutterer myself, this program works. My son had a severe stutter. Being only 5, we wondered if it was too early to get intense therapy. We had tried other avenues through school etc with no success. Within a month of seeing Mark and doing his program, my son’s stutter had improved. Within a couple months, his stutter had dramatically improved. Words can’t describe how happy my wife and I are with my son’s progress. Now five months in we continue to do his therapy at home, but no longer go to the Center(he’s doing so well). I had been so skeptical about therapy working. Immediately Mark made it clear to us that it’s process through work and dedication to get better, not a magic pill. My wife and I strongly recommend Power Stuttering Center. Thanks again, Mark!